As a restaurant owner, you’re already aware that open tables on a Friday or Saturday night are not a good thing. Ideally, your establishment would be filled with hungry patrons 7 days a week, however it’s just not always possible. But it’s always a bit more troubling to see your staff sitting around twiddling their thumbs on a night that’s typically busy. 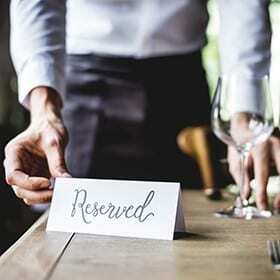 If this is an issue your business has been experiencing with the changing of the seasons, it might be time to look into making it easier (or more enticing) for customers to reserve a table. Use social media as a conduit. Although you have a reservation option on your website, people will typically only visit your website when they’re already thinking of grabbing a bite. Remind people about your awesome restaurant and include a link that redirects to the reservation page on Facebook. Don’t forget about mobile! Ensure that your website is optimized for mobile users, and that they can easily fill-out their reservation information using a phone. It only takes a minor hiccup for customers to get frustrated and decide against making a reservation. Make the reservation CTA prominent on your website. The button to make a reservation on your home page should not be tucked away in a corner! Make that call to action large and visible for visitors. Send out an email encouraging online reservations. If your reservation count has been suffering lately, try sending a marketing email to entice customers to make a reservation. Offer 20% off their total bill for making a reservation online. Reservation info should be text-based on your website. If your website contains an image that encourages customers to reserve a table, the text is not going to be picked-up by search engine crawlers. To ensure your reservation page appears when someone conducts a Google search, ensure that the reservation information section is all text-based.